Heat oven to 350°F. Spray 9-inch springform pan with cooking spray. Make brownie mix batter as directed on box, using oil, water and eggs. Spread in bottom of pan. Bake 30 minutes. Cool 10 minutes. Meanwhile, make cookie mix dough as directed on pouch, using butter and egg. 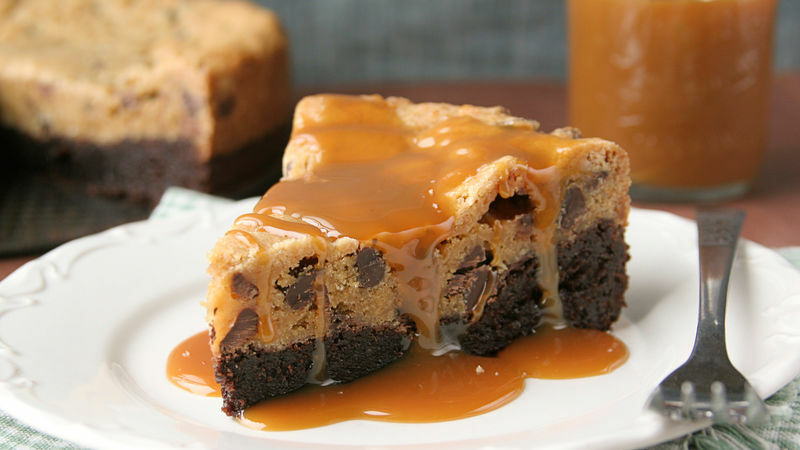 Drop cookie dough in chunks on top of partially baked brownie layer. With back of spoon or your hands, gently press cookie dough together to form an even layer. Return to oven; bake 20 minutes. Cover pan with sheet of foil; bake 10 minutes longer or until cookie layer is set. Cool at least 1 hour before cutting into wedges. Drizzle caramel topping over individual servings. Be sure to let the pie cool for at least an hour or to room temperature before serving. It will be easier to cut. Make it even more decadent and top with a scoop of ice cream.